The Ministry of Labor raised work permit fees to anywhere from $10,000 to $1,000 depending on skill level, according to a memorandum dated Thursday. KAMPALA: South Sudan has sharply increased the fees required for foreigners to work in the country — from roughly $100 to up to $10,000 — just days after famine was declared there. Even before the fee hike, the government had been repeatedly accused of restricting humanitarian aid access during the country's three-year civil war. With the famine declaration, the pleas for access are rising. The Ministry of Labor raised work permit fees to anywhere from $10,000 to $1,000 depending on skill level, according to a memorandum dated Thursday. Most foreigners in South Sudan work in humanitarian aid or the oil industry. The fee hikes apply only to foreigners and are aimed at increasing government revenue, Minister of Information Michael Makuei told The Associated Press on Saturday. 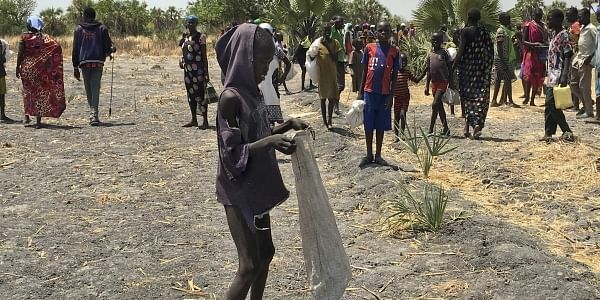 South Sudan's government and the United Nations late last month declared a famine in two counties of the East African nation, saying about 100,000 people are at risk. The next day, President Salva Kiir said his government would ensure "unimpeded access" for all aid organizations. Such promises have had little effect. Some in Kiir's government have expressed hostility toward the international community, accusing it of meddling in the country's affairs. Minister of Cabinet Affairs Martin Lomuro recently told the AP that "most of the (humanitarian) agencies are here to spy on the government." The U.N. secretary-general has been among those accusing South Sudan's government of restricting aid access during the civil war, which has killed tens of thousands and forced more than 1.5 million people to flee the country. On Friday, the U.N. said in a statement that humanitarian agencies recently were told to evacuate the famine-stricken town of Mayendit. Late Saturday after arriving for a visit, U.N. humanitarian chief Stephen O'Brien tweeted the latest promise from South Sudan's government: "Foreign Minister Deng Alor Kuol gave us unqualified assurances of free access to all areas with people suffering." The need is urgent, O'Brien said. In another tweet, he showed a starving child he said had escaped attack when his grandmother carried him through one of the swamps where many South Sudanese are hiding and eating water lilies to survive. "Parents missing. 1000s similar. Horrendous," O'Brien wrote.